Clinton, Michigan – EDEN Refried Pinto Beans, Garbanzo Beans (chick peas), Quinoa & Black Bean Chili, and two EDEN 4 oz. Snacks were selected for Men&apos;s Health magazine&apos;s 125 Best Foods For Men annual November feature. This is the eighth time EDEN foods have been honored in multiple categories by Men&apos;s Health. Men&apos;s Health wrote of the Refried Pinto Beans, "Unlike many…, Eden keeps the sodium to a minimum," and of Garbanzo Beans, "Add to soup for an instant fiber boost." In previously selecting Spicy Pumpkin Seeds they wrote, "Seasoned with soy sauce, garlic, and cayenne, these put spicy chips to shame." Speaking to the list of 125 Best Foods For Men they say, "In your quest for good health and a great body, the supermarket can be a powerful ally - or an insidious enemy. Keep this list on hand to fill your cart with the right stuff." Refried Pinto Beans and Garbanzo Beans are U.S.A. family farm organically grown, protein and fiber rich, and a good source of iron and magnesium. EDEN Refried Pinto Beans contain zero fat and have 50% less sodium than other brands with no chemical additives. 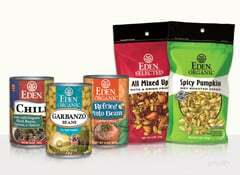 EDEN Garbanzo Beans have no salt added and are low fat. Quinoa & Black Bean Chili is organic Michigan black turtle beans, high altitude Andes mountain organic whole grain quinoa, with maitake and shiitake mushrooms cooked in a savory, 100% organic, chili spiced tomato sauce. Just heat, stir, and serve. Organic EDEN Spicy Pumpkin Seeds are a crunchy delicious dry roasted snack that is rich in protein, fiber, and magnesium, a great source of iron and zinc, and low sodium. The All Mixed Up EDEN snack is rich and nutty with a nice balance of sweet, tart, and salty. A satisfying snack that is rich in magnesium, a good source of protein and fiber, and low sodium. Eden offers all nine of it's snacks in 1 ounce single serve Pocket Snacks™ and 4 ounce reclosable pouches. All EDEN foods are pure and purifying. All five Men&apos;s Health featured EDEN foods are . Men&apos;s Health magazine acknowledging the value of EDEN brand foods is appreciated by all those who appreciate good food.